How TrueCaller Database is created ? It get our data partly through partnerships with different white/yellow pages around the world and partly through our own database. This database which is contributed by our users (opt in functionality) and maintained by them is the core value of Truecaller towards the goal of ultimate global phonebook. To clarify this even further, suppose in ‘India’ Unfortunately there are no reliable public directory services in this country. This brings us to the point where crowd sourced data is the only reliable source .According to True caller users from all over the world voluntarily contribute to this directory and in return they get access to this special database and get significantly better search results. Even in countries where they have public directories, Truecaller data is used to enhance the data quality. If you are using this application then Truecaller only access the name and phone numbers in your phone book and they will securely be sent to their servers. Also, information contributed by our users can only be accessed through number lookups (name lookups are not exposed). If you wish to unlist your phone number from Truecaller, then visit http://www.truecaller.com/unlist .The application covertly uploads users' phone books and makes them part of its crowd-sourced database. If your name is wrongly displayed on truecaller then Please go to htp://www.truecaller.com/name_suggestion and enter the suggestion of name change and they will try to evaluate it as soon as possible. Please remember to add your country code, i.e. +46, and make sure your name is correctly spelled. 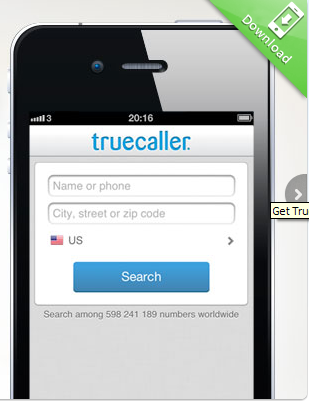 --It is not possible to trace any call with Truecaller. Truecaller does not access users’ location info in any way. --Only do Phone number lookups is possible it do not support name lookups. --Truecaller will always work provided you have 3G or EDGE or WLAN internet connection on your cellphone and the number is available on their databases. Please note that, phonebook contribution has been and always will be optional. Only phone numbers and names are used and all data is transferred and kept by Truecaller using secure methods. Users on the Android platform downloaded from Google Play will until further notice not be able to contribute to this database, but will nevertheless experience the same level of service as if they had.